Who doesn’t love a rainbow of colors in their egg basket? Our basket has everything from rich chocolate browns to glossy whites. We also have a wide variety of blues and greens. Our blue eggs come from Easter Eggers. That is the most common blue egg laying chicken. Many people wonder which breed they have. Even among breeders, there is confusion as to which classification their birds fall into. I’m going to give you a little insight into the differences and let you be the judge. Before we delve into the who’s who, let’s chat about egg color itself. All eggs are white or blue at their core. The blue eggs are laid by the breeds we are discussing here (plus Cream Legbars) and everyone else lays white. Eggs are colored in the final two hours before being laid. A pigment called protoporphyrin is slowly added to the shell in some chicken breeds as it travels down the oviduct. Protoporphyrin is brown colored. Depending on the breed and the chicken itself, the coating will be light, dark or somewhere in-between. That’s just the basics, but there is more cool stuff to learn about egg color. Once you understand how eggs get their coloring, you can learn to breed for specific colors like olive and mauve. Which blue egg breed do I have? Araucanas are a breed originating from Chile. Many believe that Araucanas must be “rumpless” in order to be considered true Araucanas, but that isn’t accurate. This desired trail is only required when you are striving for a SOP (Standard of Perfection) bird. To clarify, Orpington SOP states that a bird should have a wide, barrel-like chest, but a narrow chested Orpington is still an Orpington as long as it’s purebred. To complicate the issue of SOP further, some countries have differing SOPs. (Left) North American Araucana SOP. (Right) Australian Araucana SOP. In the case of the Araucana, North America accepts only rump-less, Australia only accepts Araucanas with tails, and the British standard accepts both. The worldwide standard is a medium to large sized bird with ear tufts, small pea comb, small feathered crest and no wattles. You can see more on the American standards at The Araucana Club of America. An example of the Ameraucana. Comb style can tell you a lot about a chicken’s breed. You can learn about all the comb styles, as well as feather patterns, in How to Find Out What Breed Your Chicken Is. Now we get to the ever confusing Easter Egger. There are two schools of thought regarding what classifies an Easter Egger. The first is that any Araucana or Ameraucana that does not meet the SOP is an Easter Egger and any other blue or green egg layer is just a barnyard mutt. 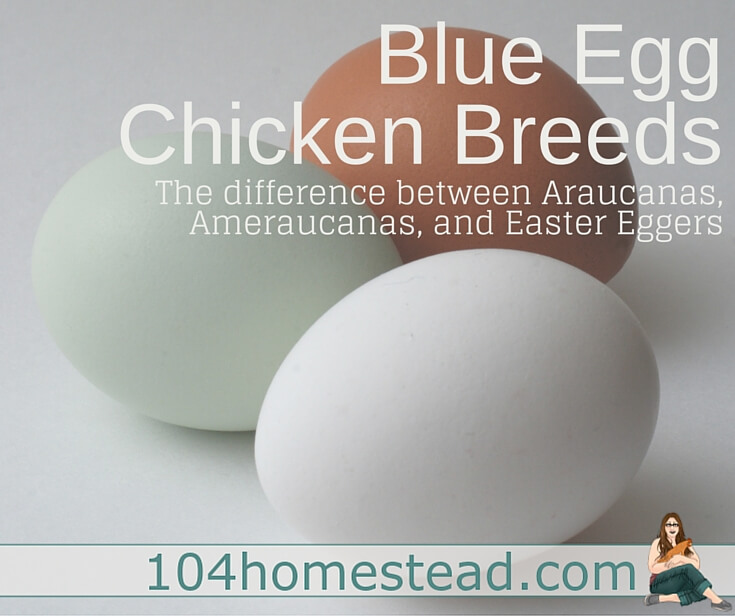 The other is that an Easter Egger is classified as an Araucana or Ameraucana that has been bred with another breed of chicken, resulting in a mixed breed bird that carries the blue egg gene. There is no SOP or recognized traits for these birds since the other breed can have any characteristics. Easter Eggers can lay any color egg since it is all up to the genetic lottery. Some examples of the variety in Easter Eggers. My personal thought about Easter Eggers is that they are mixed birds carrying the blue egg gene, regardless of if it presents. I disagree that a non-SOP purebred is suddenly a different breed. As I stated before, a purebred Orpington is still an Orpington even if it does not display all of the desired traits. So where does this leave us? Unless you acquire your Araucana or Ameraucana from a reputable source that knows the lineage of its breeder stock, you may want to assume you have an Easter Egger. For this reason, most hatchery birds sold as Ameraucanas are in fact, Easter Eggers. Regardless of which breed you end up with, these are great birds that will be sure to add a bit of flair to your egg basket. Do you have blue eggs in your egg basket? If you’re new to raising backyard chickens, I encourage you to read Chickens from Scratch: Raising Your Own Chickens from Hatch to Egg Laying and Beyond. It was written by my friend Janet and it is a wonderful resource. For more chicken fun facts and care information, subscribe to The Homestead Helper. 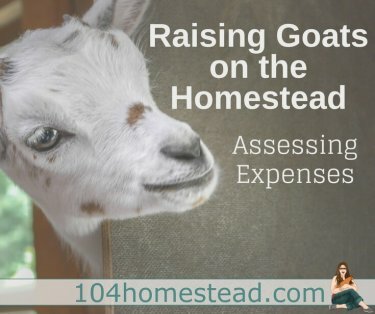 I’ll show you how to homestead where you live. We live in Australia and had an Araucana chicken 🙂 her name was White Rose…but ended up being called puff head or puffy. She was kind of crazy lol she laid eggs under the deck in her own nest well away from the coop. We lost her to a sudden severe respiratory infection 🙁 I’m planning on getting fertile Araucana eggs next spring and getting our broodies to hatch them for us. I loved those green shelled eggs! 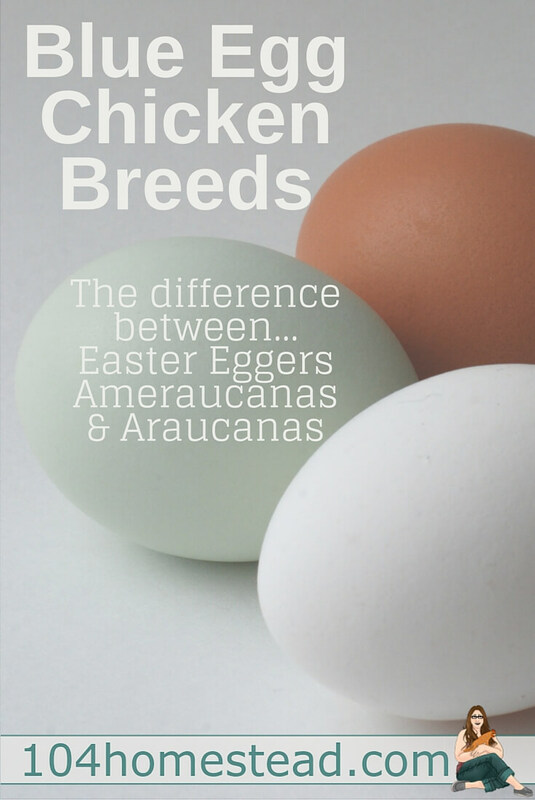 I seem to recall that MyPetChicken does a good job of explaining the Araucana/Ameraucana/Easter Egger discrepancy. We have much-beloved Easter Egger from their hatchery who lays lovely green-gray eggs. Truth be told, most chicken-keepers do not wonder which variety of blue egg layer they have- most are not aware that there are different breeds or mixed breeds (EEs).